2681001 35-66 FIAT AGRI 35-66 Wheel tractor Spare parts catalog. Operation and maintenance manual. Service/Workshop manual. 2681002 35-66 DT FIAT AGRI 35-66 DT Wheel tractor Spare parts catalog. Operation and maintenance manual. Service/Workshop manual. 2681003 45-46 FIAT AGRI 45-46 Wheel tractor Spare parts catalog. Operation and maintenance manual. Service/Workshop manual. 2681004 45-66 DT FIAT AGRI 45-66 DT Wheel tractor Spare parts catalog. Operation and maintenance manual. Service/Workshop manual. 2681005 45-76 FIAT AGRI 45-76 Wheel tractor Spare parts catalog. Operation and maintenance manual. Service/Workshop manual. 2681006 50-66 DT FIAT AGRI 50-66 DT Wheel tractor Spare parts catalog. Operation and maintenance manual. Service/Workshop manual. 2681007 50-86 FIAT AGRI 50-86 Wheel tractor Spare parts catalog. Operation and maintenance manual. Service/Workshop manual. 2681008 50-86V FIAT AGRI 50-86V Wheel tractor Spare parts catalog. Operation and maintenance manual. Service/Workshop manual. 2681009 55-46 FIAT AGRI 55-46 Wheel tractor Spare parts catalog. Operation and maintenance manual. Service/Workshop manual. 2681010 55-46 DT FIAT AGRI 55-46 DT Wheel tractor Spare parts catalog. Operation and maintenance manual. Service/Workshop manual. 2681011 55-56 FIAT AGRI 55-56 Wheel tractor Spare parts catalog. Operation and maintenance manual. Service/Workshop manual. 2681012 55-56 DT FIAT AGRI 55-56 DT Wheel tractor Spare parts catalog. Operation and maintenance manual. Service/Workshop manual. 2681013 55-66 FIAT AGRI 55-66 Wheel tractor Spare parts catalog. Operation and maintenance manual. Service/Workshop manual. 2681014 55-66 DT FIAT AGRI 55-66 DT Wheel tractor Spare parts catalog. Operation and maintenance manual. Service/Workshop manual. 2681015 55-66S FIAT AGRI 55-66S Wheel tractor Spare parts catalog. Operation and maintenance manual. Service/Workshop manual. 2681016 55-66S DT FIAT AGRI 55-66S DT Wheel tractor Spare parts catalog. Operation and maintenance manual. Service/Workshop manual. 2681017 55-76 FIAT AGRI 55-76 Wheel tractor Spare parts catalog. Operation and maintenance manual. Service/Workshop manual. 2681018 55-86 FIAT AGRI 55-86 Wheel tractor Spare parts catalog. Operation and maintenance manual. Service/Workshop manual. 2681019 55-86V, F FIAT AGRI 55-86V, F Wheel tractor Spare parts catalog. Operation and maintenance manual. Service/Workshop manual. 2681020 55-88 FIAT AGRI 55-88 Wheel tractor Spare parts catalog. Operation and maintenance manual. Service/Workshop manual. 2681021 55-90 FIAT AGRI 55-90 Wheel tractor Spare parts catalog. Operation and maintenance manual. Service/Workshop manual. 2681022 55-90 DT FIAT AGRI 55-90 DT Wheel tractor Spare parts catalog. Operation and maintenance manual. Service/Workshop manual. 2681023 56-46 FIAT AGRI 56-46 Wheel tractor Spare parts catalog. Operation and maintenance manual. Service/Workshop manual. 2681024 56-46 DT FIAT AGRI 56-46 DT Wheel tractor Spare parts catalog. Operation and maintenance manual. Service/Workshop manual. 2681025 60-56 FIAT AGRI 60-56 Wheel tractor Spare parts catalog. Operation and maintenance manual. Service/Workshop manual. 2681026 60-56 DT FIAT AGRI 60-56 DT Wheel tractor Spare parts catalog. Operation and maintenance manual. Service/Workshop manual. 2681027 60-66 FIAT AGRI 60-66 Wheel tractor Spare parts catalog. Operation and maintenance manual. Service/Workshop manual. 2681028 60-66 Cabine FIAT AGRI 60-66 Cabine Wheel tractor Spare parts catalog. Operation and maintenance manual. Service/Workshop manual. 2681029 60-66 DT FIAT AGRI 60-66 DT Wheel tractor Spare parts catalog. Operation and maintenance manual. Service/Workshop manual. 2681030 60-66 DT-F FIAT AGRI 60-66 DT-F Wheel tractor Spare parts catalog. Operation and maintenance manual. Service/Workshop manual. 2681031 60-66 F FIAT AGRI 60-66 F Wheel tractor Spare parts catalog. Operation and maintenance manual. Service/Workshop manual. 2681032 60-66 F ORCHARD FIAT AGRI 60-66 F ORCHARD Wheel tractor Spare parts catalog. Operation and maintenance manual. Service/Workshop manual. 2681033 60-66S FIAT AGRI 60-66S Wheel tractor Spare parts catalog. Operation and maintenance manual. Service/Workshop manual. 2681034 60-66S DT FIAT AGRI 60-66S DT Wheel tractor Spare parts catalog. Operation and maintenance manual. Service/Workshop manual. 2681035 60-76 F/DT FIAT AGRI 60-76 F/DT Wheel tractor Spare parts catalog. Operation and maintenance manual. Service/Workshop manual. 2681036 60-76 FIAT AGRI 60-76 Wheel tractor Spare parts catalog. Operation and maintenance manual. Service/Workshop manual. 2681037 60-76 F FIAT AGRI 60-76 F Wheel tractor Spare parts catalog. Operation and maintenance manual. Service/Workshop manual. 2681038 60-86 FIAT AGRI 60-86 Wheel tractor Spare parts catalog. Operation and maintenance manual. Service/Workshop manual. 2681039 60-86V, F FIAT AGRI 60-86V, F Wheel tractor Spare parts catalog. Operation and maintenance manual. Service/Workshop manual. 2681040 60-88 FIAT AGRI 60-88 Wheel tractor Spare parts catalog. Operation and maintenance manual. Service/Workshop manual. 2681041 60-90 FIAT AGRI 60-90 Wheel tractor Spare parts catalog. Operation and maintenance manual. Service/Workshop manual. 2681042 60-90 DT FIAT AGRI 60-90 DT Wheel tractor Spare parts catalog. Operation and maintenance manual. Service/Workshop manual. 2681043 60-93 FIAT AGRI 60-93 Wheel tractor Spare parts catalog. Operation and maintenance manual. Service/Workshop manual. 2681044 60-93 DT FIAT AGRI 60-93 DT Wheel tractor Spare parts catalog. Operation and maintenance manual. Service/Workshop manual. 2681045 60-94 FIAT AGRI 60-94 Wheel tractor Spare parts catalog. Operation and maintenance manual. Service/Workshop manual. 2681046 60-94 DT FIAT AGRI 60-94 DT Wheel tractor Spare parts catalog. Operation and maintenance manual. Service/Workshop manual. 2681047 62-86 FIAT AGRI 62-86 Wheel tractor Spare parts catalog. Operation and maintenance manual. Service/Workshop manual. 2681048 62-86X FIAT AGRI 62-86X Wheel tractor Spare parts catalog. Operation and maintenance manual. Service/Workshop manual. 2681049 65-46 FIAT AGRI 65-46 Wheel tractor Spare parts catalog. Operation and maintenance manual. Service/Workshop manual. 2681050 65-46 DT FIAT AGRI 65-46 DT Wheel tractor Spare parts catalog. Operation and maintenance manual. Service/Workshop manual. 2681051 65-56 FIAT AGRI 65-56 Wheel tractor Spare parts catalog. Operation and maintenance manual. Service/Workshop manual. 2681052 65-56 DT FIAT AGRI 65-56 DT Wheel tractor Spare parts catalog. Operation and maintenance manual. Service/Workshop manual. 2681053 65-66 FIAT AGRI 65-66 Wheel tractor Spare parts catalog. Operation and maintenance manual. Service/Workshop manual. 2681054 65-66 DT FIAT AGRI 65-66 DT Wheel tractor Spare parts catalog. Operation and maintenance manual. Service/Workshop manual. 2681055 65-66S FIAT AGRI 65-66S Wheel tractor Spare parts catalog. Operation and maintenance manual. Service/Workshop manual. 2681056 65-66S DT FIAT AGRI 65-66S DT Wheel tractor Spare parts catalog. Operation and maintenance manual. Service/Workshop manual. 2681057 65-88 FIAT AGRI 65-88 Wheel tractor Spare parts catalog. Operation and maintenance manual. Service/Workshop manual. 2681058 65-90 FIAT AGRI 65-90 Wheel tractor Spare parts catalog. Operation and maintenance manual. Service/Workshop manual. 2681059 65-90 DT FIAT AGRI 65-90 DT Wheel tractor Spare parts catalog. Operation and maintenance manual. Service/Workshop manual. 2681060 65-93 FIAT AGRI 65-93 Wheel tractor Spare parts catalog. Operation and maintenance manual. Service/Workshop manual. 2681061 65-93 DT FIAT AGRI 65-93 DT Wheel tractor Spare parts catalog. Operation and maintenance manual. Service/Workshop manual. 2681062 65-94 FIAT AGRI 65-94 Wheel tractor Spare parts catalog. Operation and maintenance manual. Service/Workshop manual. 2681063 65-94 DT FIAT AGRI 65-94 DT Wheel tractor Spare parts catalog. Operation and maintenance manual. Service/Workshop manual. 2681064 66-66 DT-F ORCHARD FIAT AGRI 66-66 DT-F ORCHARD Wheel tractor Spare parts catalog. Operation and maintenance manual. Service/Workshop manual. 2681065 70-56 FIAT AGRI 70-56 Wheel tractor Spare parts catalog. Operation and maintenance manual. Service/Workshop manual. 2681066 70-56 DT FIAT AGRI 70-56 DT Wheel tractor Spare parts catalog. Operation and maintenance manual. Service/Workshop manual. 2681067 70-66 FIAT AGRI 70-66 Wheel tractor Spare parts catalog. Operation and maintenance manual. Service/Workshop manual. 2681068 70-66 Cabine FIAT AGRI 70-66 Cabine Wheel tractor Spare parts catalog. Operation and maintenance manual. Service/Workshop manual. 2681069 70-66 DT FIAT AGRI 70-66 DT Wheel tractor Spare parts catalog. Operation and maintenance manual. Service/Workshop manual. 2681070 70-66 DT-F FIAT AGRI 70-66 DT-F Wheel tractor Spare parts catalog. Operation and maintenance manual. Service/Workshop manual. 2681071 70-66 DT-F ORCHARD FIAT AGRI 70-66 DT-F ORCHARD Wheel tractor Spare parts catalog. Operation and maintenance manual. Service/Workshop manual. 2681072 70-66 DT FIAT AGRI 70-66 DT Wheel tractor Spare parts catalog. Operation and maintenance manual. Service/Workshop manual. 2681073 70-66 F FIAT AGRI 70-66 F Wheel tractor Spare parts catalog. Operation and maintenance manual. Service/Workshop manual. 2681074 70-66 F ORCHARD FIAT AGRI 70-66 F ORCHARD Wheel tractor Spare parts catalog. Operation and maintenance manual. Service/Workshop manual. 2681075 70-66 HC FIAT AGRI 70-66 HC Wheel tractor Spare parts catalog. Operation and maintenance manual. Service/Workshop manual. 2681076 70-66 LP FIAT AGRI 70-66 LP Wheel tractor Spare parts catalog. Operation and maintenance manual. Service/Workshop manual. 2681077 70-66S FIAT AGRI 70-66S Wheel tractor Spare parts catalog. Operation and maintenance manual. Service/Workshop manual. 2681078 70-66S DT FIAT AGRI 70-66S DT Wheel tractor Spare parts catalog. Operation and maintenance manual. Service/Workshop manual. 2681079 70-76 FIAT AGRI 70-76 Wheel tractor Spare parts catalog. Operation and maintenance manual. Service/Workshop manual. 2681080 70-76 LP FIAT AGRI 70-76 LP Wheel tractor Spare parts catalog. Operation and maintenance manual. Service/Workshop manual. 2681081 70-86 FIAT AGRI 70-86 Wheel tractor Spare parts catalog. Operation and maintenance manual. Service/Workshop manual. 2681082 70-86V, F FIAT AGRI 70-86V, F Wheel tractor Spare parts catalog. Operation and maintenance manual. Service/Workshop manual. 2681083 70-88 FIAT AGRI 70-88 Wheel tractor Spare parts catalog. Operation and maintenance manual. Service/Workshop manual. 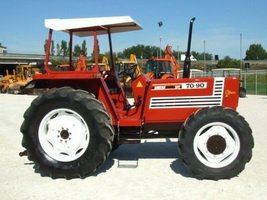 2681084 70-90 FIAT AGRI 70-90 Wheel tractor Spare parts catalog. Operation and maintenance manual. Service/Workshop manual. 2681085 70-90 DT FIAT AGRI 70-90 DT Wheel tractor Spare parts catalog. Operation and maintenance manual. Service/Workshop manual. 2681086 72-86 FIAT AGRI 72-86 Wheel tractor Spare parts catalog. Operation and maintenance manual. Service/Workshop manual. 2681087 72-86 LP FIAT AGRI 72-86 LP Wheel tractor Spare parts catalog. Operation and maintenance manual. Service/Workshop manual. 2681088 72-93 FIAT AGRI 72-93 Wheel tractor Spare parts catalog. Operation and maintenance manual. Service/Workshop manual. 2681089 72-93 DT FIAT AGRI 72-93 DT Wheel tractor Spare parts catalog. Operation and maintenance manual. Service/Workshop manual. 2681090 72-94 FIAT AGRI 72-94 Wheel tractor Spare parts catalog. Operation and maintenance manual. Service/Workshop manual. 2681091 72-94 DT FIAT AGRI 72-94 DT Wheel tractor Spare parts catalog. Operation and maintenance manual. Service/Workshop manual.